Prefer moving stuff? There is a video version of this inspirational quote. Simply scroll down to watch it. Linda Grayson is an author and artist from California. Her career includes episodes of animation, interior design, painting and drawing. Grayson has gnerated ovet 130 million dollars in sales in the gift industry and she’s now licensing her art. To our interest in her inspirational quotes, Linda Grayson is also an author and illustrator of three children’s books. Motivation and inspiration can be found, among other places, in food. Yup, food can be not only comforting but also inspiring. And among all foods and drinks, it seems like chocolate holds a special place in our culture. There is something special about chocolate and we all know it the second it touches our tongue. In human relationships, friendship also holds a special place. It is a strong glue and foundation of our communities and life. Put those two together, friendship and chocolate, in one inspirational quote – and you have a winner! 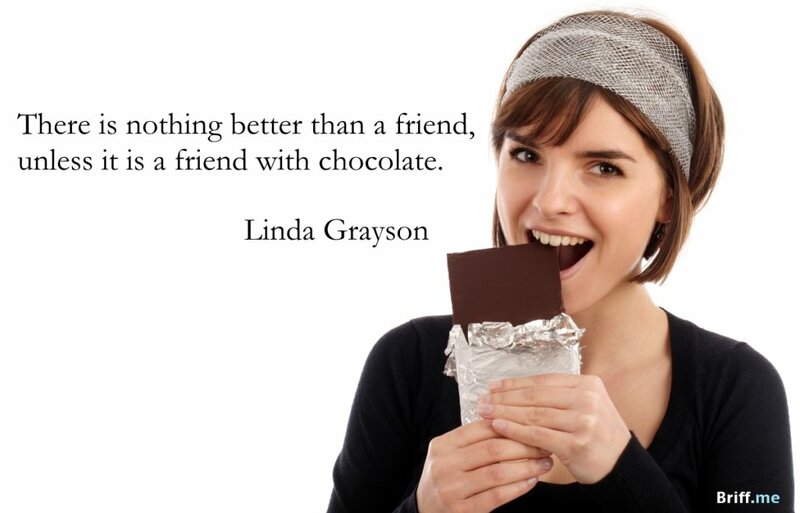 Linda Grayson’s quote about a friend with chocolate connects these two strong elements with an inspiring lesson for life. Our team of editors here at Briff.me, knows that our time together on Earth is waaay too short for a long feed, and so we work hard to find, edit and bring to you the best posts, like this quotes briff with an inspirational quote by Linda Grayson. To connect with the team and get more posts like this, please like the Briff.me Facebook page. If you read all the way to this bottom area, you are a probably on a quest for inspiration, so why not try another quote? Click here for words of wisdom by Albert Einstein.